The World’s Biggest Starbucks is Open for Business in Tokyo! The biggest Starbucks in the world has just opened up its glorious new doors in the trendy Tokyo neighborhood of Nakameguro. 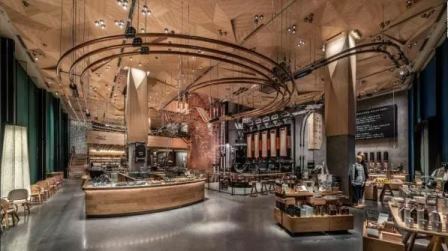 Not just serving your stock-standard, run-of-the-mill, everyday caramel latte, this Starbucks Reserve Roastery is four floors of “Sutaba” Starbucks madness with each dedicated to a different signature beverage. Nakameguro has just become home to the biggest of five Starbucks Reserve Roasteries across the globe, surpassing the previous world’s largest store in Shanghai, with Milan, New York, and Seattle following behind. The first of its kind in Japan, this Starbucks Reserve Roastery in Tokyo has a massive floor space of 32,000 square feet across four stories, and with 250 staff, this roastery and shop is truly a marvel. 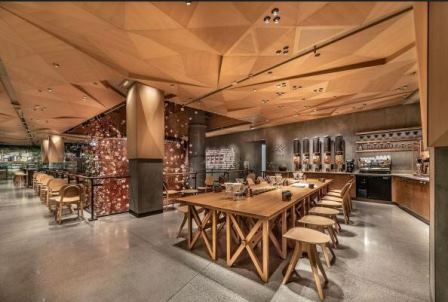 Takafumi Minaguchi, the Japan CEO, describes Tokyo’s Starbucks Reserve Roastery as “kind of like a coffee wonderland.” The vision of the store is to incorporate the roasting and the shop together, creating an experience in itself where customers can explore the floors freely, or just hang out and relax. Both a roastery and a lavish Starbucks shopfront at the same time, everything is roasted, brewed and baked onsite. The first floor Main Bar greets you with impressively high ceilings and theatrical bronze piping; the designers were bang on the money with that whimsical Charlie and the Chocolate Factory vibe. The design of the store allows you to see behind the scenes and be a part of the inner workings of the coffee, giving that atmosphere of industrial chic. You can see the beans roasting first hand, and being shot around the store in the pipes zigzagging overhead along the ceiling. Customers are encouraged to wander the different floors, as the store is designed to be an immersive journey of coffee with all kinds of fusions and experimental drinks. 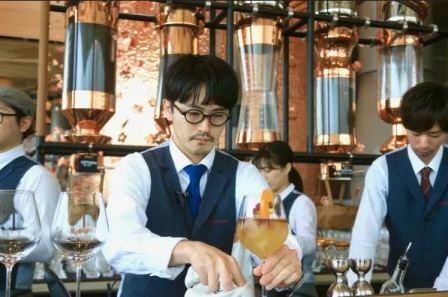 At Tokyo’s Starbucks Reserve Roastery, there are over 100 drinks on the menu, all elaborately garnished or with flavor combinations you’d never dreamed of. Think black tea lattes with turmeric cotton candy to and jasmine tea with popsicles inside, for example, while they also serve a Barrel-Aged Cold Brew and exclusive alcoholic drinks too. Every day, you can try five different beans from other Starbucks reserve stores from all over the world, as they are shipped over and roasted freshly onsite. 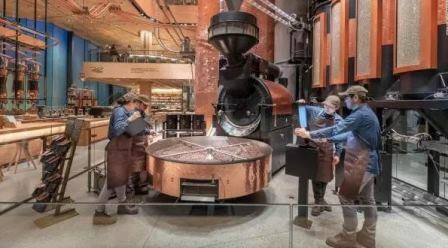 Now the biggest Starbucks roaster in the world, the floor to ceiling roasting machine is a whopping 17 meters high, acting as the main centerpiece and curiosity of the store. 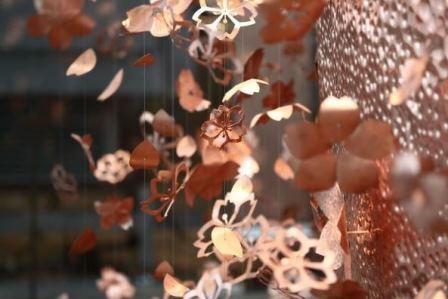 The 2,100 sakura blossoms hanging from the cask are handmade from copper, in homage to the beautiful cherry blossoms that over-run Nakameguro each spring. The area is infamous for being one of the best places for sakura hanami viewing in Tokyo. Liz Muller, the chief head of design for Starbucks, has somehow transformed the world’s biggest coffee chain store experience into something magical, and unlike anywhere in the world. The design was considered from the ground up, with huge glass windows and terraced floors and an open plan layout. 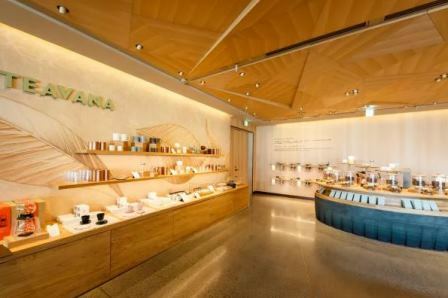 The experimental but justifiably hip exterior, well-fitting to the Nakameguro area, is brought to you by the Starbucks community design team in collaboration with Japanese architect, Kengo Kuma. He is known for his stunning modern work with Japanese influences and has gained even more fame for designing the Olympics main host stadium for Tokyo 2020. With hanging planter boxes reminiscent of bonsai trees and an “origami” ceiling, Japanese culture has been built into the space, right down to inspiration from traditional joinery of temples and shrines. 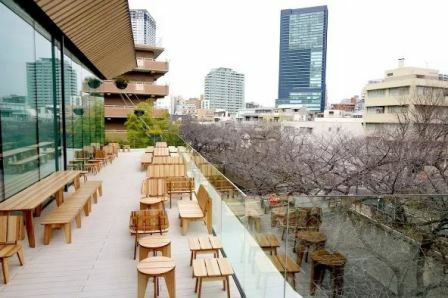 The Starbucks Reserve Roastery in Tokyo has a glorious outdoor terrace that overlooks the Meguro River, where the view across the cherry blossoms along the route will be glorious come spring time. The roastery is intended to be “the third place”, that is a space where you can spend time between work and home. Sit back, relax, and slowly sip your exclusive Starbucks Reserve Roastery drink, coffee or alcoholic, the choices are simply wild. And, if you need a snack, from cronuts to focaccia pizza, you can satisfy your hunger with something from the resident Milanese bakery, Princi. Italian flour is shipped to the roastery but the pastries, of course, are baked freshly onsite. Geometric ceramic mugs line the walls of the second floor, home to the biggest Teavana tea bar in the world. Here you can try over 20 different types of tea in all sorts of concoctions, with different flavors spanning green to black from across the globe. Keeping in mind the tea ceremony culture in Japan, you can have an array of beverages and desserts together in this tea bar. Head upstairs to the third floor to find Japan’s first Arriviamo Cocktail Bar, another signature part of the Starbucks Reserve Roasteries. At this luxurious bar, you’ll find them serving tipples with, of course, a coffee twist. With many exclusive drinks, their special Nakameguro Espresso Martinis, for example, are made with local chocolate from Green Bean to Bar. 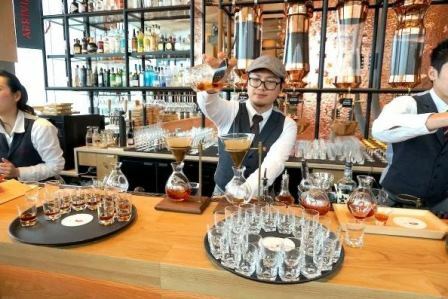 However you can get wine, beer, and spirits too, but be wary after a long day at the office, the exclusive coffee and whiskey mixology named, “Tokyo Pour Over” will set you back 3,000 yen a glass. The top floor is home to the Inspiration Lounge, a community space designed for locals to host events, and Starbucks wants it to become a learning hub with training workshops and seminars about coffee. Here, they hope to eventually use the facilities to train people in coffee certifications. The Starbucks staff and baristas are also, of course, immaculate and expertly informed on the inner and outer workings of Starbucks and its coffee supply chain. Customers are encouraged to feel at home and be inquisitive, and interest cultivated by the creative space and its sensory coffee immersion. The store is meant to be a unique experience and a place where customers are encouraged to learn, discover and enjoy at their own pace. Starbucks has 200 Reserve bars around the world, however, most of them are spread throughout Asia. This premium Tokyo store will also an innovation lab, like the other roasteries around the world. You can test the latest Starbucks drinks first exclusively at these roasteries around the world, and no doubt the Tokyo store will follow suit. The roastery is intended as a unique in-store experience that is exciting and luxurious, exclusive and enticing, a space for innovation where Starbucks plans to hold design and concept testing of new products. As is the whole Japan experience, if you are heading over to Nakameguro to check out the hype, be prepared to queue. Even with a ticketing system, you could be waiting for a few hours to get inside alongside thousands of other Sutaba fans. Starbucks is expecting massive crowds to be visiting the new store as cherry blossom season is on the horizon, and where else better to get the next limited edition sakura latte than at Nakameguro in spring. Open everyday 7 PM till 11 PM, you can get your luxury Starbucks experience at your leisure, and of course plenty of custom Starbucks Reserve Roastery merch. Tokyo by Food is a platform for food events in Tokyo, with over 80 experiences to choose from and a fantastic resource for learning about Japan’s thriving food culture! What’s more, Tokyo by Food runs a charitable outreach program, the Food for Happiness Project, which donates 10 meals to children in Cambodia for each person who books a food event through our platform!